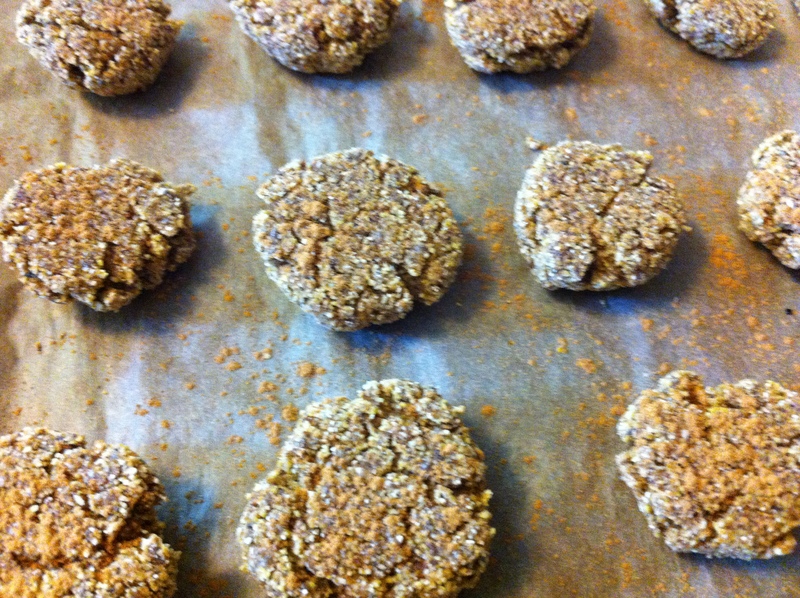 Pinole Wafers- Looking for the Tarahumara Energy! As I’ve hinted at previously, I am clearly not the chef in our household. Luckily, I live with a delightfully talented kitchen maestro so I typically get to sit back and serve as the official taste-tester for some wonderfully delicious recipes! However, as I indicated in my last post, I have recently been on a quest to find low-sugar nutrition options for my long runs. The gels and chomps just seem so much more sugary now that I’ve given up most refined sugars in my diet. Incidentally, after reading (and loving) the book Born to Run, I’ve been wanting to make some variation on the Pinole utilized by the Tarahumara, as wonderfully described by the author. I also went through a brief phase where I wanted to run long ultramarathons through the desert, but I got over that after realizing I didn’t really like the heat all that much. Since my training for the fall is just beginning to ramp up, I thought this seemed like the perfect time to boldly venture into the kitchen and try my hand at a Pinole recipe. There are quite a few recipes out there, but they all contain about the same ingredients and proportions. I happen to read one of the blogs that came up high on my Google search, so it made it that much easier to pull up a starter recipe. Thus, I assembled my main ingredients, and began the process. I chose to add ginger and vanilla paste to hopefully add a bit more flavor and anti-inflammatory properties, as I had read many reviews that remarked on the bland nature of Pinole. 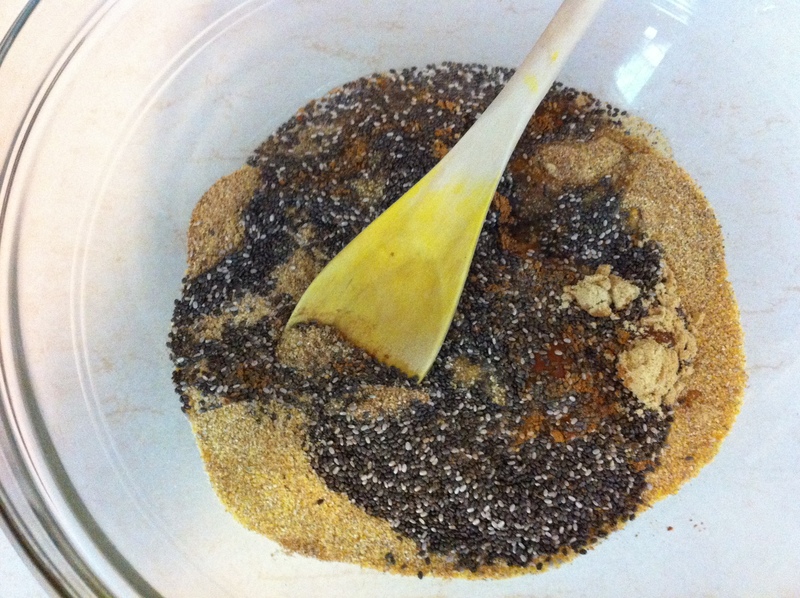 You could certainly add just about any other spice combination you’d like, as it won’t disrupt the chemistry of the final batter/dough/mixture. Hot peppers are especially anti-inflammatory, so perhaps some ground peppers would add a kick, although I’m not sure my stomach would take too kindly to the peppers during a 4-hour run! 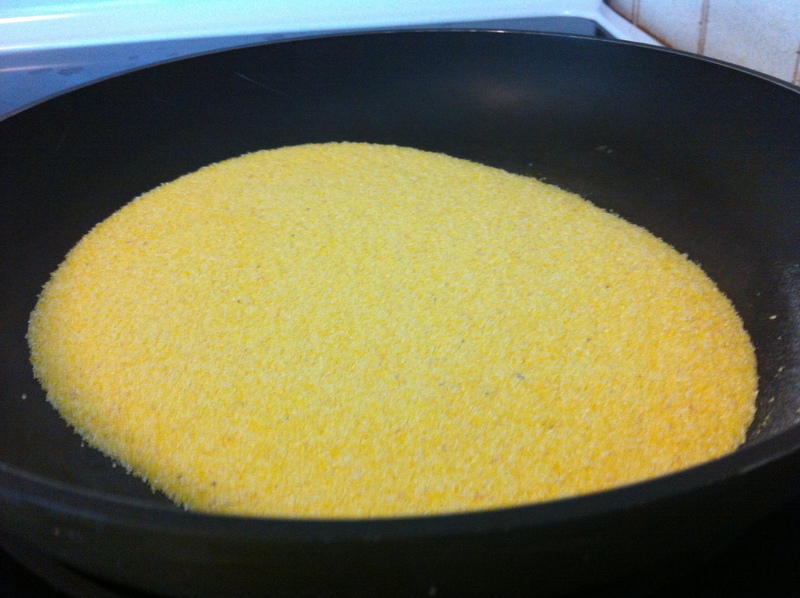 First, toast the cornmeal on medium heat, until the grains take on a light brown color. It will start to smoke, so you may want to disable your smoke detector first! 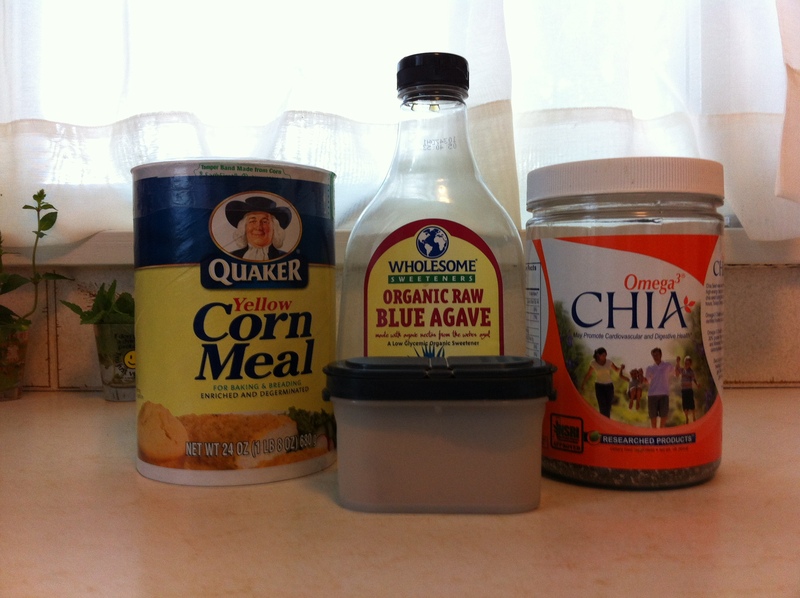 Next, mix the dry ingredients together, and then add the agave nectar. You’ll notice that I haven’t mentioned water yet. At this juncture, you have a few options. 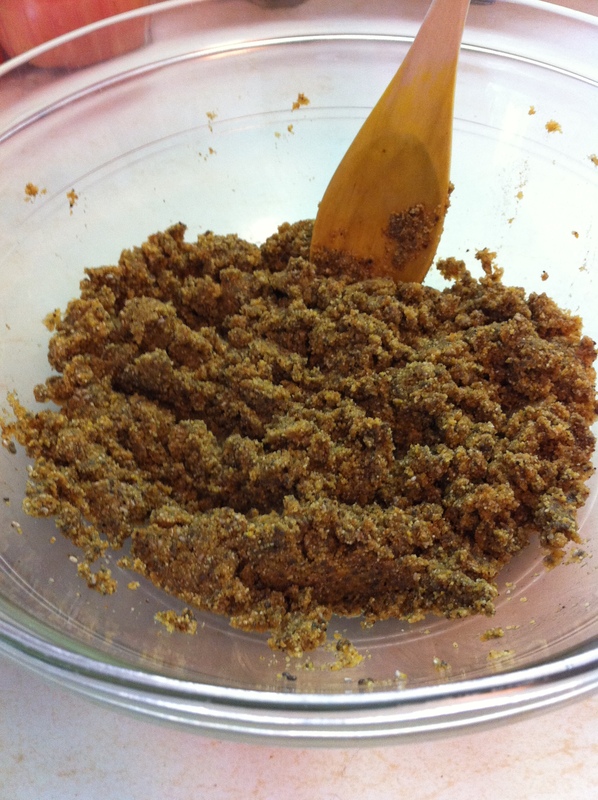 Pinole can be made and eaten as a paste, as a wafer, or as a drink. If you would like to eat it as a paste, I would suggest starting with 3/4 cup of water, and adding more until you reach a desired consistency. At that point, you could very easily portion it out into small zip-lock bags, and simply bite off a corner of the bag, much like tearing the top off of an energy gel. If you are looking to use the Pinole as a drink, you can now add 1 tbsp of the mixture to 2 cups of water, and dissolve it as best you can. It will give you a rather grainy drink, but might be easier to consume for some. I chose to bake the pinole into small wafers, which I thought would be portable and allow me to easily experiment with different portions during my runs. I added 1/2 cup of water to the mixture, which proved to be perfect. However, if the mixture still seems dry and crumbly (depending on the add-ins you threw in), go ahead and add more water, 1 tbsp at a time. Pretend you are making little energy snowballs- you want the snow to stick, but it should break apart upon impact for maximum coverage (I do not, however, encourage using the mixture for this purpose, although a good food fight every now and again isn’t a bad thing either!). The completed mixture resembles cookie dough in consistency, only more grainy. Before adding the water, go ahead and preheat your oven to 375 degrees. 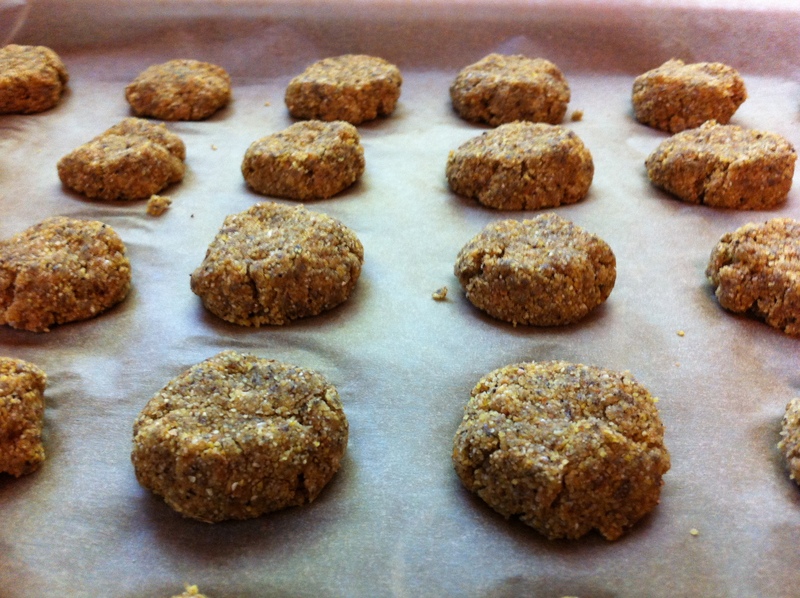 After adding the water, you can form the mixture into bite-size balls, and lay them on a parchment-paper lined baking sheet. You can choose your own size, but I wouldn’t make them much smaller than a quarter when flattened. Once the oven is ready, bake the wafers for 10-11 minutes. You can check them at this point, to see that they have firmed up a bit, and leave them in a bit longer if they still feel too doughy. They aren’t going to harden, but the edges will start to separate a bit as they bake. Once they come out of the oven, go ahead and lightly dust them with your flavor of choice. Cinnamon, cocoa powder, powdered ginger, or even a flavored salt would work great. If you aren’t quite ready to give up on the sugar yet, you could even sprinkle some powdered sugar over them. The nice thing about these wafers really is the flexibility you have to add additional ingredients without disrupting the consistency of the mixture too much. I headed out yesterday morning for my first big test with these wafers. I am sure you will notice, as did I, that the grainier consistency of these wafers means it takes a bit longer to chew and swallow them, but they also break up in your mouth pretty easily, which allows you to go at your own pace. I ended up consuming 1-2 every 30-45 minutes, which at the time seemed like enough. However, later in my run, I could tell my energy wasn’t as high as I would like. I’m going to shift to 3 wafers every 30-45 minutes and see how much of a difference it has on my endurance. As with all nutrition, it’s important to play around with the proportions and find out what works best for you. I haven’t reached a verdict yet on the viability of Pinole as a nutrition substitute, but I’m pretty happy with this first round of tests, and I’ll no doubt be experimenting much more in the weeks to come! If you have tried any of the Pinole recipes out there (or other alternative nutrition recipes), I’d love to hear about them. 🙂 Happy running! I really am enjoying the “pinole mash” method. A tablespoon of sugar in all that is all I really need (and it’s almost too much for me–this coming from a woman who loves six lumps in her java). It pulled me right out of the midday zonk. I’m considering trying different ways of prepping my pinole. I might’ve bought my last 99¢ energy bar thanks to this stuff. At least you always have energy! You never know when the running bug will catch you!